In the early 1960s, brothers in Minnesota wrote National Executive Secretary Brother H. Carl Moultrie, in regards to the status of Xi chapter, whose most famous member is Roy Wilkins, former Executive Secretary of the NAACP. Brother Moultrie responded by mentioning that the chapter had become inactive. He also mentioned that it would take fifteen undergraduate brothers to be considered for reactivation. Over the course of the next few months, brothers rallied to get the required number of brothers. Efforts fell short of the required number of Brothers to reactivate Xi chapter, so reactivation of Xi chapter did not happen. Consequently, the brothers in Minnesota called for the establishment of a graduate chapter, which could be established with fewer members. 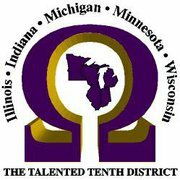 This led to the establishment of Epsilon Rho Chapter of Omega Psi Phi Fraternity, Inc. on Friday, March 9, 1962, in Minneapolis, Minnesota. Epsilon Rho was founded during the 51st year of the fraternity’s existence. This was the spring following the Golden Anniversary of the fraternity. The nine names on the original charter application are Brothers Ray Pleasant, John Sims Sr., William O. White, Albert McClure, Tyler Howell Jr., Thomas Stovall, Wilbur Cartwright, Ted Allen, and Maceo Moody. Brother Ray Pleasant and Brother Tyler Howell Jr. were elected as the first Basileus and Vice Basileus, respectively. As other brothers such as John Work IV, Cleveland Vaughn, Jesse Overton Sr., etc. arrived; the chapter grew in number and stature. Two out of the nine founding fathers of Epsilon Rho chapter are still alive today. The remaining founders are Brothers Ray Pleasant and John Sims, Sr. The other seven founding fathers of Epsilon Rho chapter have entered Omega chapter. As a result of the chapter's early activities, University of Minnesota students were attracted to the fraternity, resulting in the foundation of future undergraduate and graduate brothers. Undergraduate members of Epsilon Rho became part of the campus "leadership" of Black students who petitioned the University for a more "integrated" campus. In March of 2018 Epsilon Rho Celebrated its 56 year legacy of service to the twincities. Select the link below to view the pillars of our past and the celebration of our present.